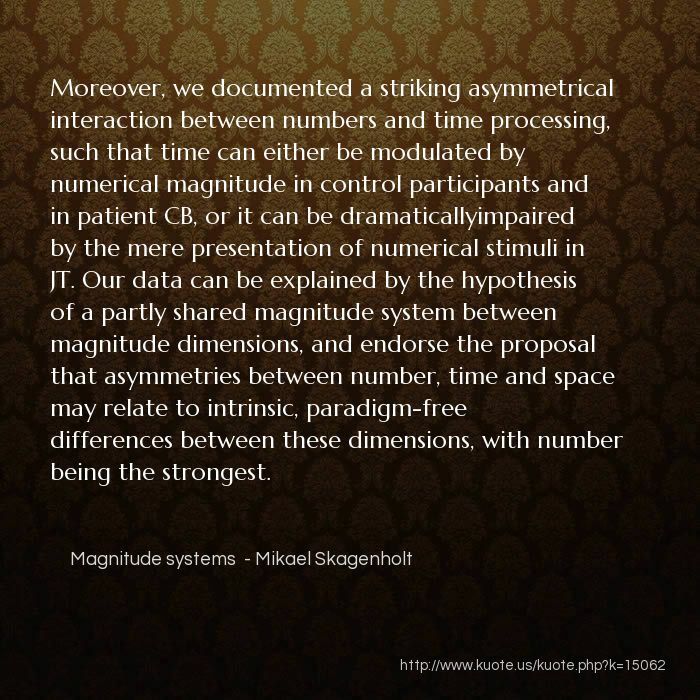 Moreover, we documented a striking asymmetrical interaction between numbers and time processing, such that time can either be modulated by numerical magnitude in control participants and in patient CB, or it can be dramaticallyimpaired by the mere presentation of numerical stimuli in JT. 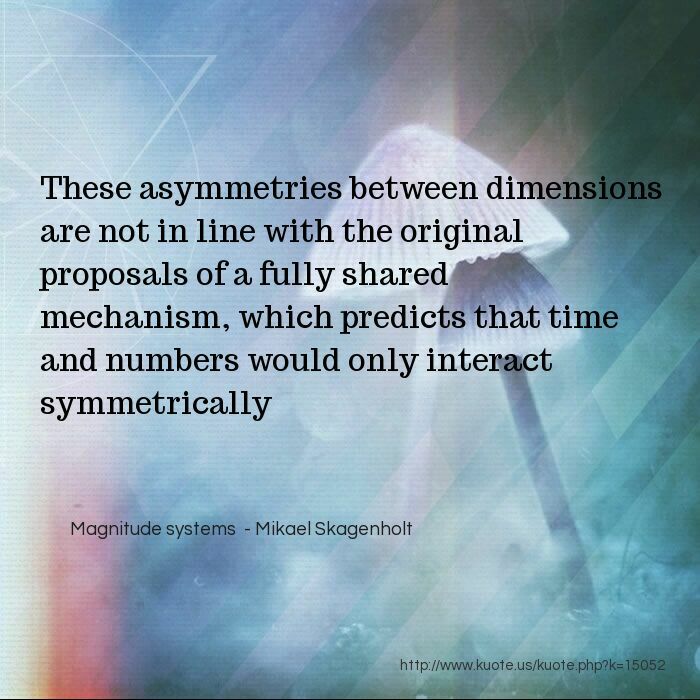 Our data can be explained by the hypothesis of a partly shared magnitude system between magnitude dimensions, and endorse the proposal that asymmetries between number, time and space may relate to intrinsic, paradigm-free differences between these dimensions, with number being the strongest. 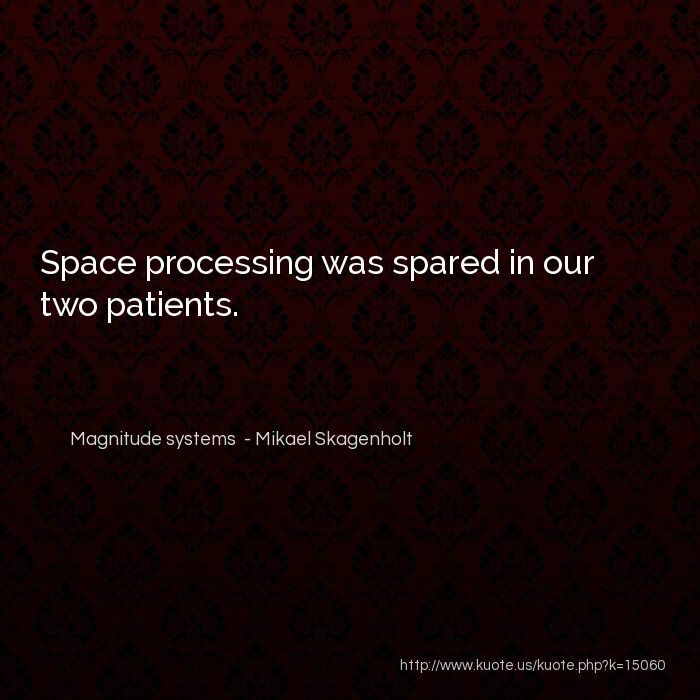 Space processing was spared in our two patients. 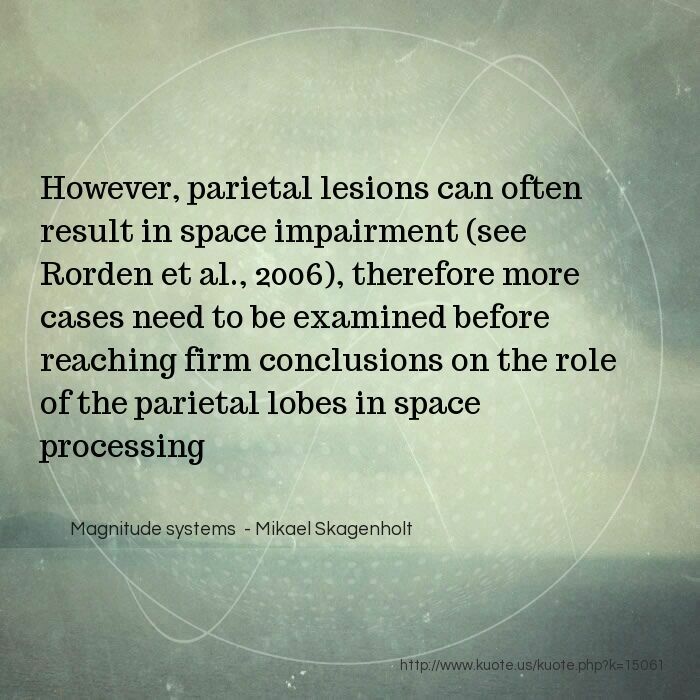 The locus of the magnitude system shared among number, time and space processing has been originally proposed in the right inferior parietal cortex (e.g. Walsh, 2003). 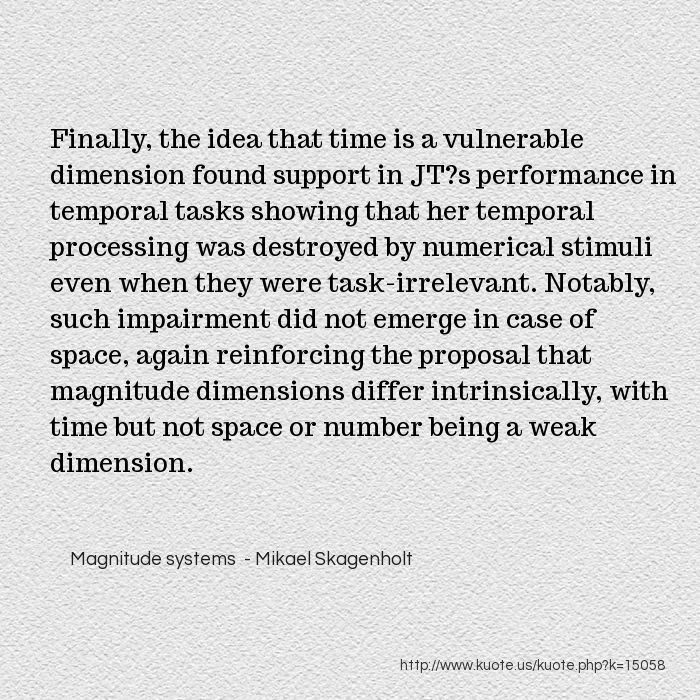 However, the selectively impaired numerical and temporal processing shown here, together with preserved space processing in both patients are difficult to accommodate within this proposal. Finally, the idea that time is a vulnerable dimension found support in JT?s performance in temporal tasks showing that her temporal processing was destroyed by numerical stimuli even when they were task-irrelevant. 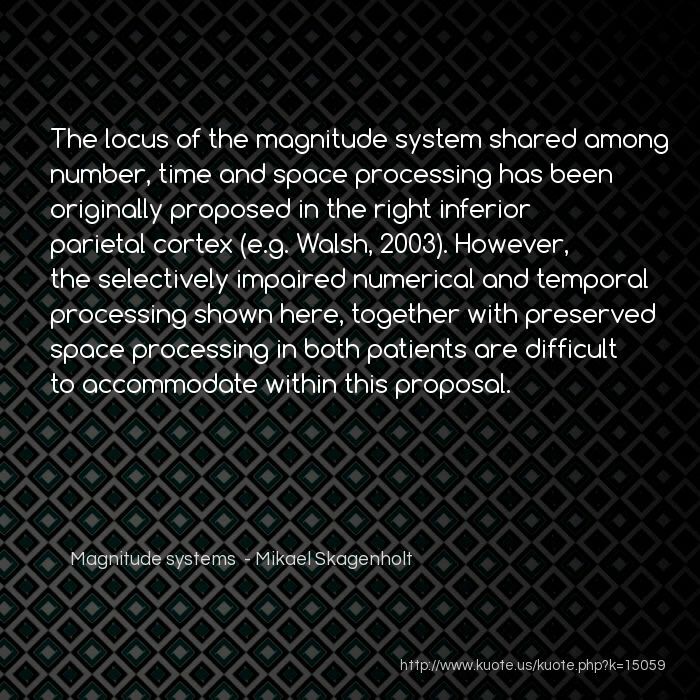 Notably, such impairment did not emerge in case of space, again reinforcing the proposal that magnitude dimensions differ intrinsically, with time but not space or number being a weak dimension. 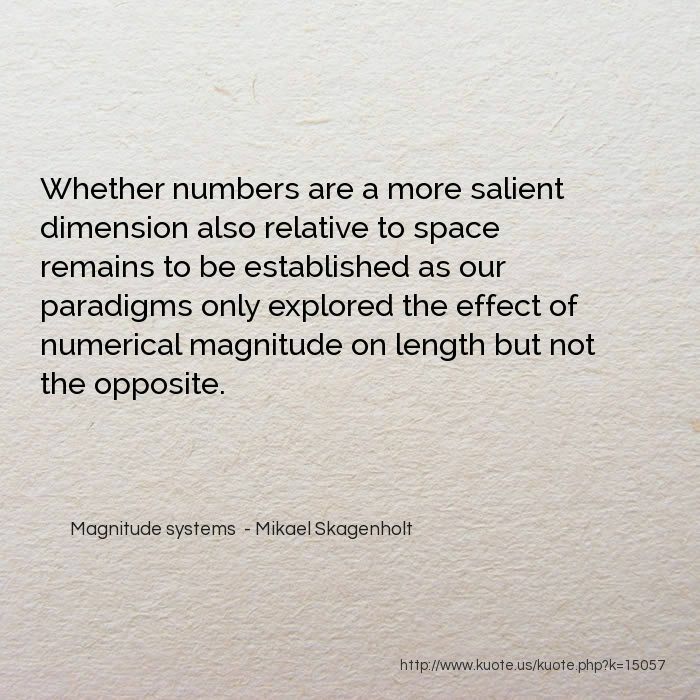 Whether numbers are a more salient dimension also relative to space remains to be established as our paradigms only explored the effect of numerical magnitude on length but not the opposite. 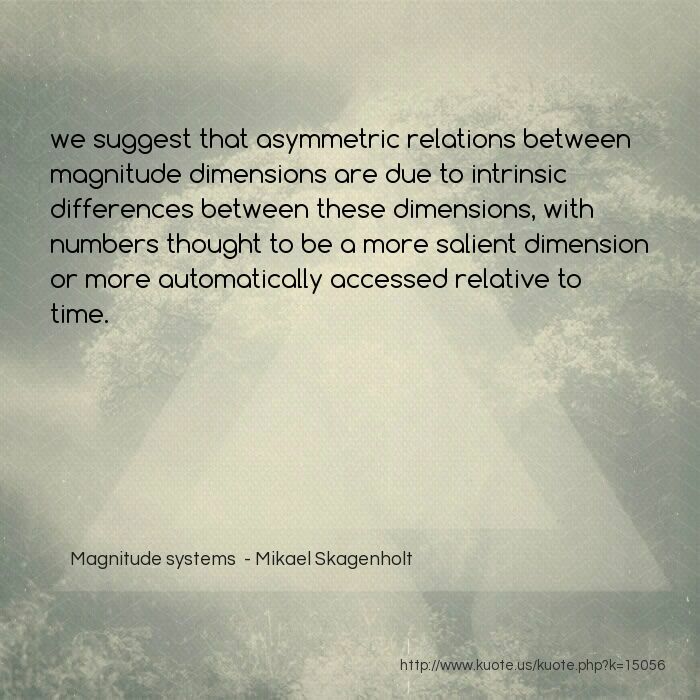 we suggest that asymmetric relations between magnitude dimensions are due to intrinsic differences between these dimensions, with numbers thought to be a more salient dimension or more automatically accessed relative to time. 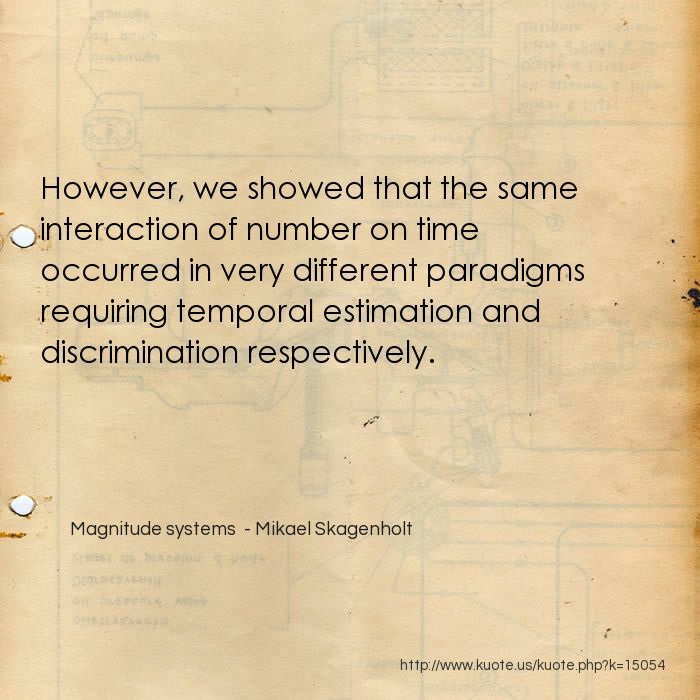 However, we showed that the same interaction of number on time occurred in very different paradigms requiring temporal estimation and discrimination respectively. 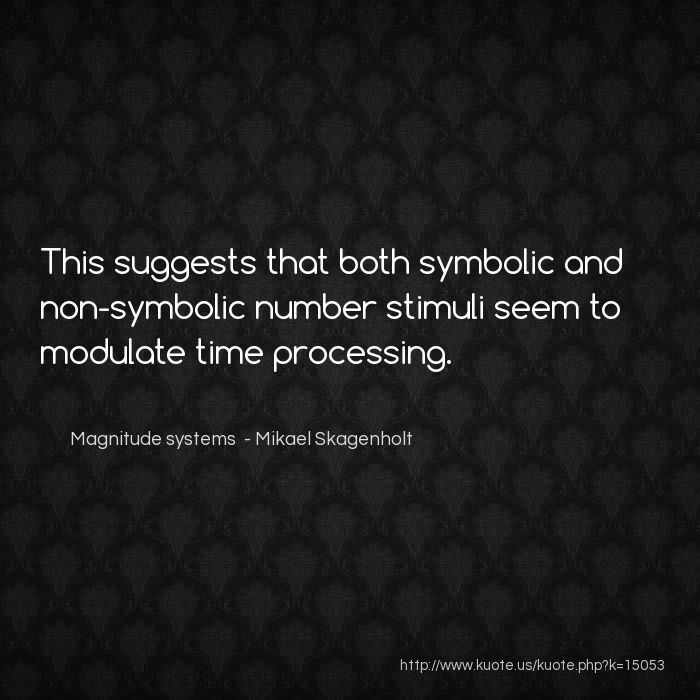 This suggests that both symbolic and non-symbolic number stimuli seem to modulate time processing. 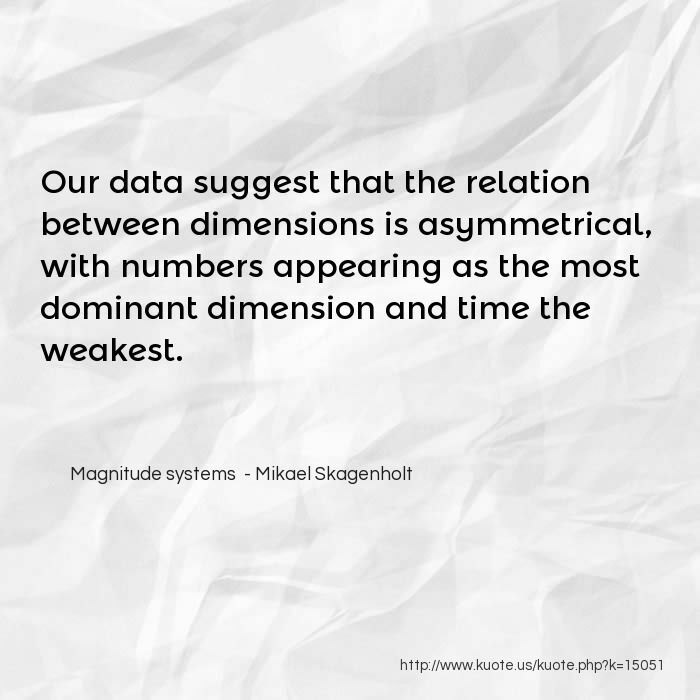 Our data suggest that the relation between dimensions is asymmetrical, with numbers appearing as the most dominant dimension and time the weakest. 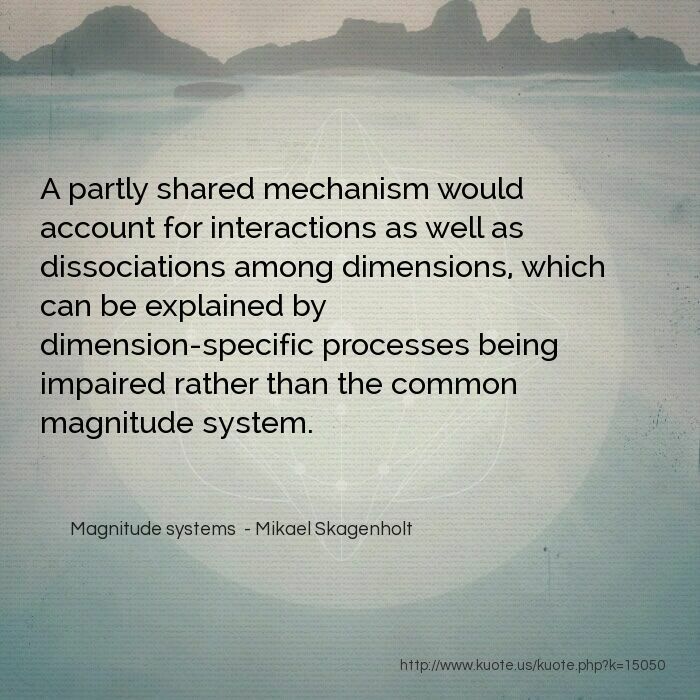 A partly shared mechanism would account for interactions as well as dissociations among dimensions, which can be explained by dimension-specific processes being impaired rather than the common magnitude system. 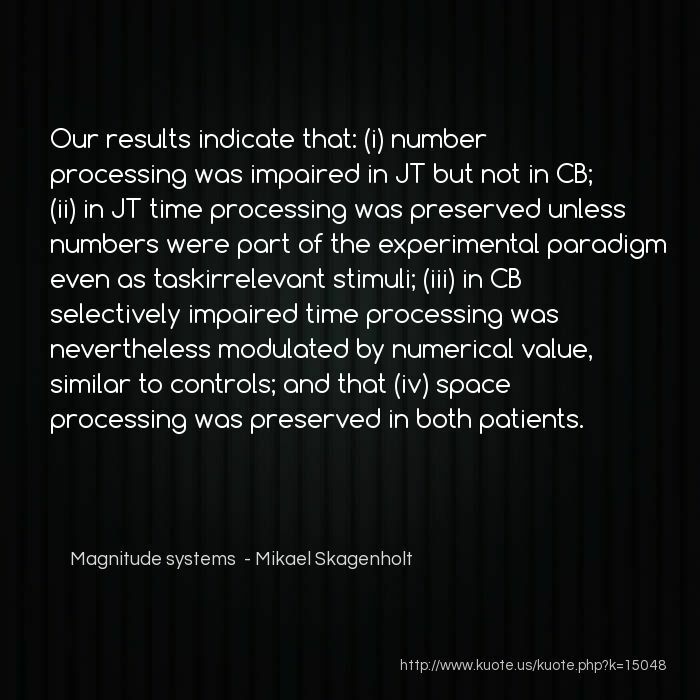 Our results indicate that: (i) number processing was impaired in JT but not in CB; (ii) in JT time processing was preserved unless numbers were part of the experimental paradigm even as taskirrelevant stimuli; (iii) in CB selectively impaired time processing was nevertheless modulated by numerical value, similar to controls; and that (iv) space processing was preserved in both patients. 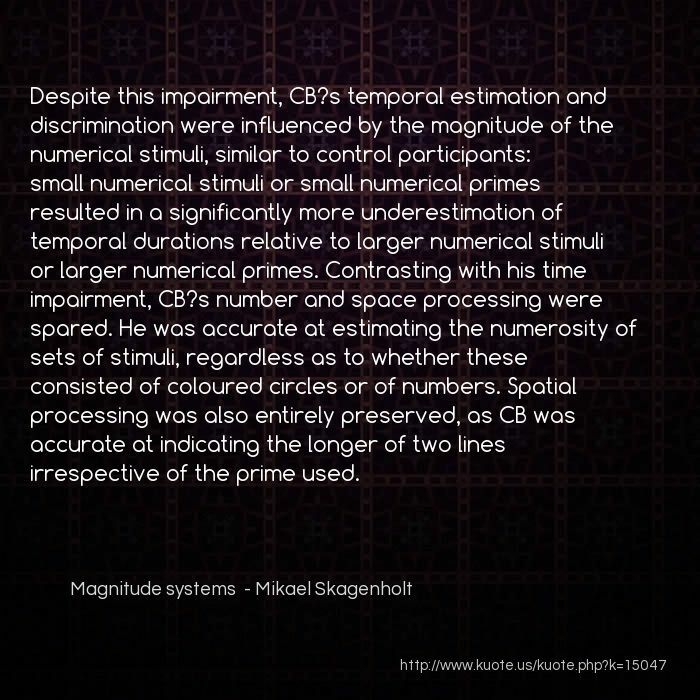 Despite this impairment, CB?s temporal estimation and discrimination were influenced by the magnitude of the numerical stimuli, similar to control participants: small numerical stimuli or small numerical primes resulted in a significantly more underestimation of temporal durations relative to larger numerical stimuli or larger numerical primes. 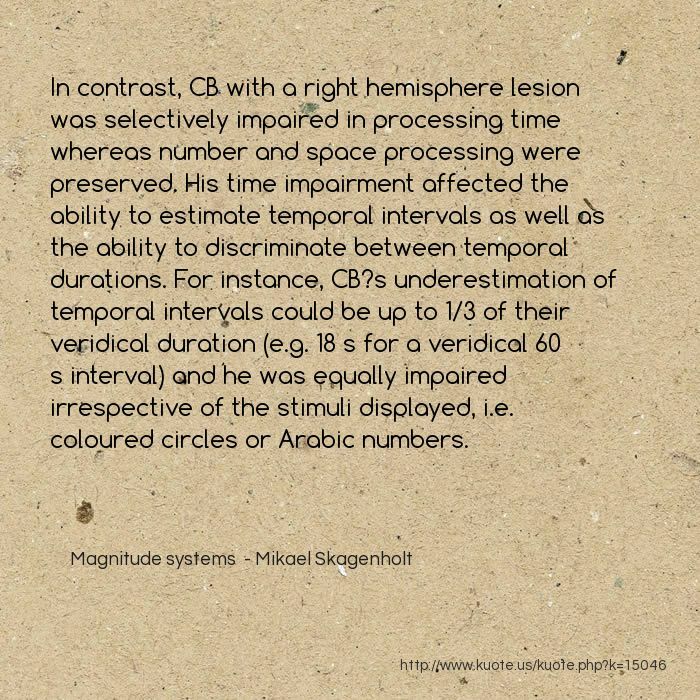 Contrasting with his time impairment, CB?s number and space processing were spared. 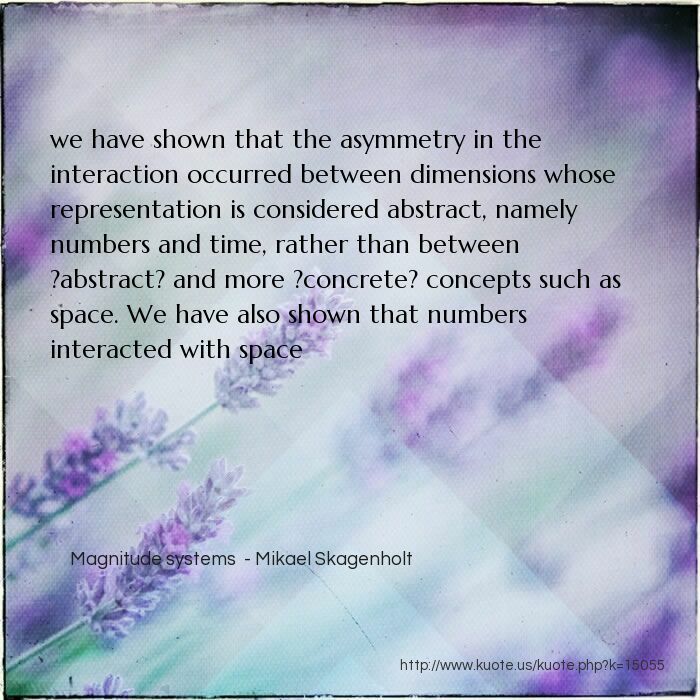 He was accurate at estimating the numerosity of sets of stimuli, regardless as to whether these consisted of coloured circles or of numbers. Spatial processing was also entirely preserved, as CB was accurate at indicating the longer of two lines irrespective of the prime used. In contrast, CB with a right hemisphere lesion was selectively impaired in processing time whereas number and space processing were preserved. His time impairment affected the ability to estimate temporal intervals as well as the ability to discriminate between temporal durations. For instance, CB?s underestimation of temporal intervals could be up to 1/3 of their veridical duration (e.g. 18 s for a veridical 60 s interval) and he was equally impaired irrespective of the stimuli displayed, i.e. coloured circles or Arabic numbers. 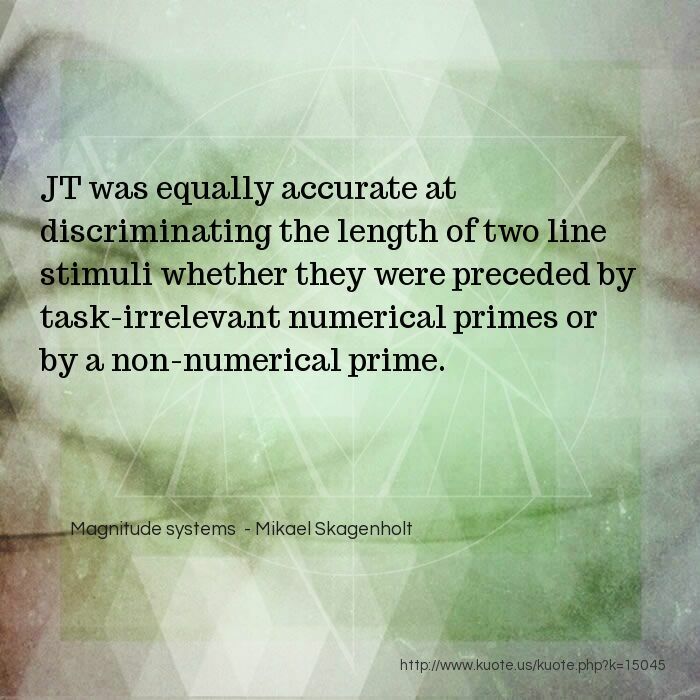 JT was equally accurate at discriminating the length of two line stimuli whether they were preceded by task-irrelevant numerical primes or by a non-numerical prime. 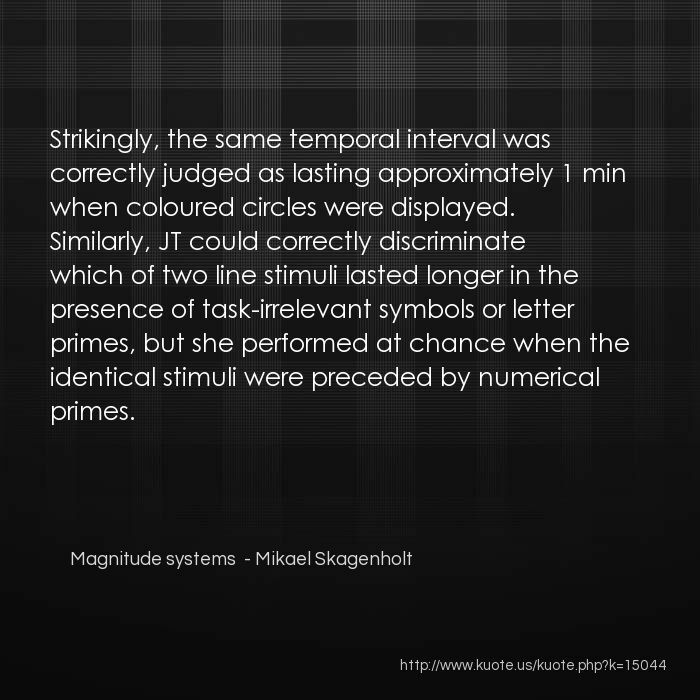 Strikingly, the same temporal interval was correctly judged as lasting approximately 1 min when coloured circles were displayed. Similarly, JT could correctly discriminate which of two line stimuli lasted longer in the presence of task-irrelevant symbols or letter primes, but she performed at chance when the identical stimuli were preceded by numerical primes. 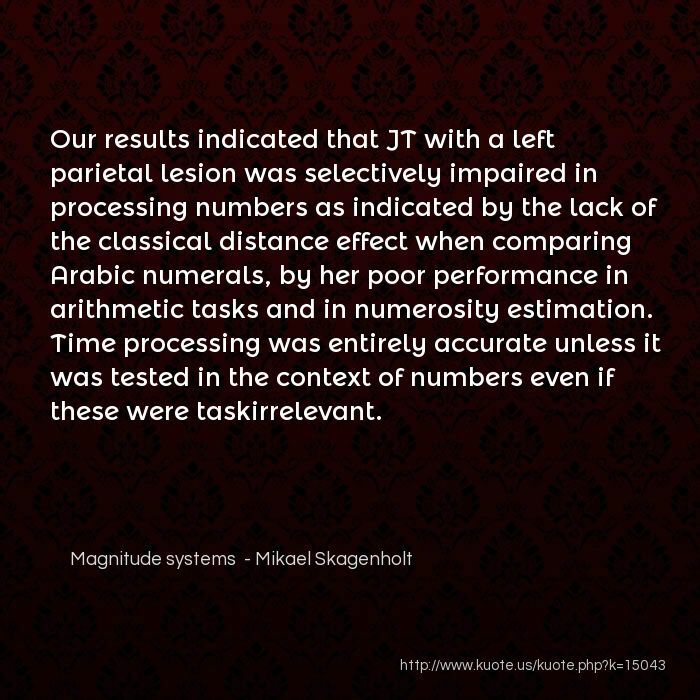 Our results indicated that JT with a left parietal lesion was selectively impaired in processing numbers as indicated by the lack of the classical distance effect when comparing Arabic numerals, by her poor performance in arithmetic tasks and in numerosity estimation. 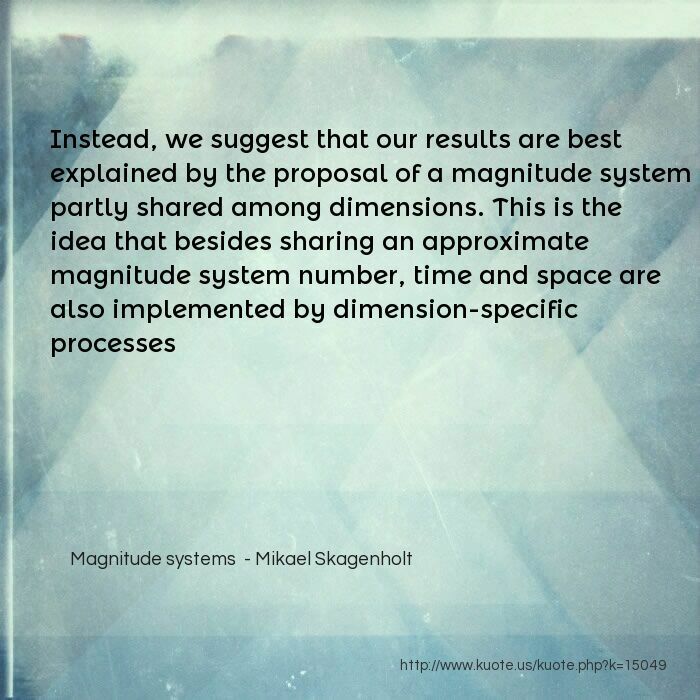 Time processing was entirely accurate unless it was tested in the context of numbers even if these were taskirrelevant.